Serving military families through the support of volunteer doulas. I began my doula journey over 25 years ago, by accident really. I was helping my friend Tammy, a fellow Navy spouse. At the time, our husbands were deployed together. She was my amazing, strong and independent friend who was about to have her baby without her husband or family. She had thanked me for being one of the few people, or maybe the only person, who had told her that my birth from 1 year prior was a positive and wonderful experience. She asked if she could call on me if it happened that she needed a little help. I, of course, said yes, having little idea that it would add an amazing chapter to my life. Her son Donny wasn’t the only one born that day, doula Maria had arrived as well, and I have enjoyed and been amazed by every birth since then. 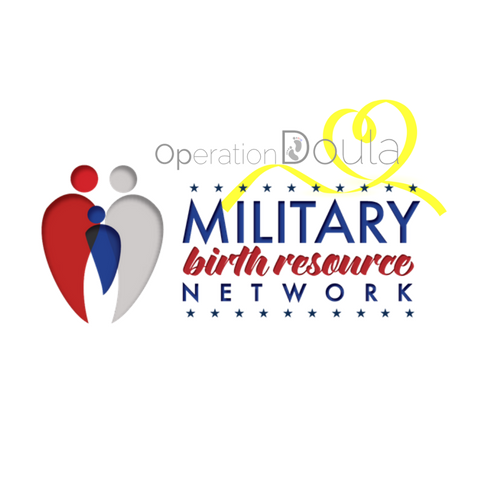 Today I am the founder of Operation Doula with Military Birth Resource Network. We provide professionally trained birth doulas to military families at no cost. Unfortunately, it is not unusual for a mom delivering at our local military hospital to arrive to L & D completely alone. Deployments and family separation often interfere with the support a mom would usually have present. Some women haven’t lived here long enough to develop deep enough friendships with people capable of lending a helping hand at a birth. Family can be many states away and sometimes can’t afford to leave work and fly in to help. Professional doulas are readily available for hire, but most military families, whether enlisted or officer, lack the resources to afford the costs that can range from $500 to $1000 per birth. Military families’ resources are limited by frequent moves, interruptions to income of the non-military spouse, travel fees, and relocation expenses. Ultimately, they have a higher than average need for birth support and a less than average ability to obtain that support. At Balboa Hospital in San Diego, moms now have the support they need through Operation Doula. We are an emergency backup system in place to help any mom who needs that extra layer of support in addition to the wonderful medical staff of Corpsmen, Nurses, Midwives and Doctors who we love working with as a team. Volunteer doulas join mom once they are admitted and in active labor, and they remain with mom until baby arrives. Hiring a doula is always best and is encouraged because it allows for mom-doula bonding prior to delivery and for a tailored approach that deals with a mom’s specific needs and education. But if you can’t afford to hire one, that doesn’t change your need for one. At Balboa, those needs are met with our volunteers. Currently, San Diego is the only location to offer volunteer services for military families. The Military Birth Resource Network is expanding to other locations to provide Operation Doula, and other support programs, at other military installations. This requires time, networking, building relationships with base hospitals, and many supporters, including doulas who want to volunteer their time for military families. The Military Birth Resource Network invites you to donate in effort to support the expansion of this program, expecting military families who cannot afford doula support and funding new doulas to become trained to work with these families. All doulas, whether volunteer or members listed on the website, who serve with the Military Birth Resource Network must be trained by an internationally recognized organization and sign and agree to MBRN's SOP & COE's.